Home » Festivals & Projects » CirkOOH! CirkAAH! For more info on CirkOOH! CirkAAH! 2016: CLICK HERE. The festival will continue for of 5 t. e. m. 13 August in the Central workshops in Kessel-Lo. 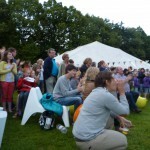 In 2012 we organized the international youth circus festival CirkOOH! CirkAAH! for a third time in Leuven. 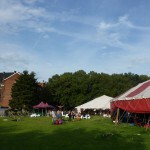 More than 60 children from three Leuven neighborhood projects with a special focus on vulnerable groups, came to practice circus on our festival area for a week. They trained and created performances and finally they performed twice for an enthusiastic audience of parents and circus enthusiasts. The following week we saw the children again in our public workshops or performances by foreign artists. For two weeks 100 jonge circus artists- and percussion artists of youth groups from Russia, Estonia, Belgium, Portugal and Slovenia lived together on our circus grounds. They got to know each other, went on field trips, built pyramids together and performed. Each group performed twice during a week full of vibrant local and foreign circus acts. Young Belgian talent also got a special place within the program and every show was introduced by a percussion collective full of ambiance. In 2001 Cirkus In Motion organized for the first time an International Youth Circus Festival on the grounds of the Sportkot Heverlee. More than 60 young people from 6 from different countries came together for a week of workshops, performances and international exchange. 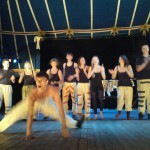 – 100 Leuven small circus performers!